Currently there are eight species and 10 subspecies of Eumenes known in America north of Mexico (Arnett 2000). Only Eumenes fraternus Say and the nominate subspecies of Eumenes smithii Saussure occur in Florida. These wasps make the familiar jug-like mud nests found on buildings, window sills, screens, and shrubs around the home. Members of the subfamily Eumenidae may be identified to genus with the aid of a key in Parker (1966). The only key for identifying North American species of Eumenes is that of Isley (1917) which is somewhat out of date. Eumenes fraternus occurs from about the 100th meridian eastward in the United States and Canada. The nominate subspecies of Eumenes smithii is found in the southern states from Mississippi eastward and North Carolina southward. The subspecies Eumenes smithii belfragei Cresson occurs from Mexico northward through eastern Texas, Oklahoma, Kansas, and eastward to Missouri and Arkansas. Figure 1. Adult potter wasp, Eumenes fraternus Say. Photograph by Lyle J. Buss, University of Florida. Nests: Although many wasps make mud nests, the jug-like pots of Eumenes are not easily confused with those of other species. Nests of this type, found around the home, are almost certainly made by Eumenes. According to Isley (1917), the nest of Eumenes smithii may be distinguished from that of Eumenes fraternus by the more granular and roughened surface due to small lumps of earth. This observation was based on one nest, however, and is probably not a consistent difference. Eggs are suspended from slender threads from either the top of side of the pot (Arnett 2000). Adults: Eumenes have a characteristic appearance. Adults are 13 to 17 mm in length (Arnett 2000). The first abdominal segments are rather elongate (i.e., petiolate), increasing gradually in width posteriorly from the point of attachment at the thorax. One other genus of eumenid wasp (Zethus) could easily be confused with Eumenes, but the second abdominal segment is more petiolate and the posterior margin of the second submarginal cell truncates whereas in Eumenes, the cell is acute. Figure 2. Eumenes spp. wing (A) and abdomen (B). Drawing by Division of Plant industry. Figure 3. Zethus spp. wing (A) and abdomen (B). Drawing by Division of Plant industry. Eumenes fraternus is most readily separated from Eumenes smithii by color: Eumenes fraternus is black with a few pale yellowish white markings, while Eumenes smithii is black with extensive reddish orange markings. Isley (1917) gave several morphological differences which are not as obvious as color. Little detailed information is available on the biology of any North American species of Eumenes. The habits of Eumenes smithii are essentially unknown, whereas Eumenes fraternus has had only fragmentary consideration. Say (1824) noted that an adult Eumenes fraternus emerged through the side of its clay pot in July. Isley (1914) reported and illustrated two nests of Eumenes fraternus from a dogwood limb in Kansas. 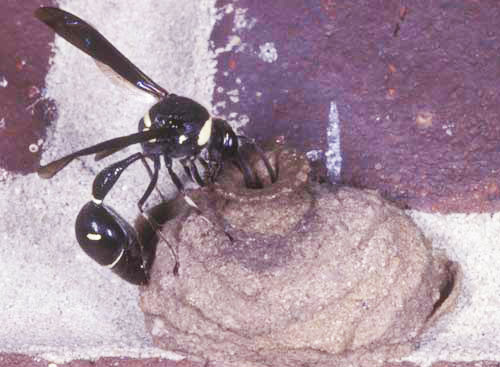 The nests were found in March and adult wasps emerged in May. The two earth pots were attached to each other so that one lateral wall served for both. Isley (1917) listed some of the fragmentary references to this species. Arnett (2000) states that the adults fly from June to October to visit flowers to gather moth and beetle larvae, and that the female's eggs are suspended from slender threads attached to the top of sides of the pot. A general review of literature pertaining to Eumenes biology was given by Iwata (1953) who also described the biology of five Japanese species. He found that Eumenes did not gather mud for its nest, but first collected water, and then mixed it with dry soil. Mud pellets were transported in the wasp's mandibles with the aid of its forelegs. Iwata estimated several hundred trips were required to build a mud pot, taking one to two hours for the entire building process. The female then inserted her abdomen and laid an egg suspended by a filament from the upper surface of the mud cell. the female next gathered lepidopterous larvae which she stung and placed in the pot. According to Iwata, females of some species provisioned for as long as nine days, often taking more than an hour to capture each prey. After provisioning, she plugged the mouth of the pot with mud and flew away to begin another nest. Linsley (1962) briefly discussed the nighttime, or resting, activity of a few North American Eumenes. He found males resting on plants 1 to 4 inches below the tips of stems and twigs. Aggregations of two to 10 individuals rested with their bodies vertical to the ground, head upward, and holding on by mandibles and legs. If the groups were all males, none were in contact. If females were present, pairing off of the sexes occurred. Although the general life cycle is probably similar for most Eumenes, many points of behavior will undoubtedly vary according to the species involved. As with many wasps, their destruction of insects that attack cultivated and ornamental plants far outweighs the unsightliness of the few mud pots you might find on your home, other structures and in the garden. Occasional nests that must be removed may be scraped off with any blade-like object. As only immatures wasps inhabit the mud nests, there is no danger of a wasp sting. Isley D. 1914. The biology of some Kansas Eumenidae. Kansas University Science Bulletin 8: 233-309. Isley D. 1917. A synopsis of the petiolate wasps of the family Eumenidae (Hymenoptera), found in America north of Mexico. Annals of the Entomological Society of America 10: 345-366. Iwata K. 1953. Biology of Eumenes in Japan. Mushi 25: 25-46. Linsley EG. 1962. Sleeping aggregations of aculeate Hymenoptera. — II. Annals of the Entomological Society of America 55: 148-164. Parker FD. 1966. A revision of the North American species in the genus Leptochilus (Hymenoptera: Eumenidae). Miscellaneous Publications of the Entomological Society of America. 5: 151-229. Say T. 1824. In Keating's narrative of an expedition to the source of St. Peter's river, Lake Winnepeck, Lake of the Woods, under the command of Major Long 1823. Philadelphia. Appendix 2. pp. 268-378. Author: E.E. Grissell (retired), Florida Department of Agriculture and Consumer Services, Division of Plant Industry. Originally published as DPI Entomology Circular 146. Updated for this publication. Publication Date: April 2007. Latest revision: July 2016. Reviewed: December 2017.